Enjoy details from the 2018 trip! Dr. Winston O'Boogie Jr and Gary Harrison Davis playing at the Cavern Club in Liverpool. 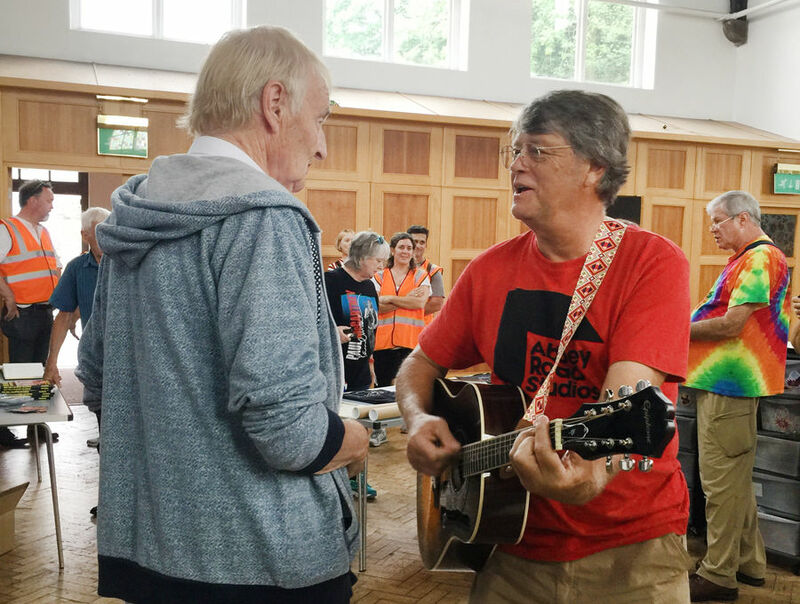 Jim Fraser, right, leader of the Beatlemaniacs of The Villages, plays a song with Len Garry, the bass player for the Quarrymen, John Lennon’s first band. The two are in St. Peter’s Church in Liverpool, site of Paul McCartney and Lennon’s first meeting. The Beatlemaniacs spent four days in London and Liverpool checking out Beatles locations. The duo joined several other members of the Beatlemaniacs of The Villages on the trip of a lifetime, spending three days in London and four days in Liverpool from July 8 to 15. “It was great to see their reactions,” Fraser said. The majority of the 23-person tour group was making its first magical mystery tour to various Beatles landmarks in the United Kingdom. “I wanted to see all the Beatles’ history,” said Kevin Grand, of the Village of Pine Hills. For Robert Coffman, it was his first trip overseas. In addition to talking with people who were associated with the Beatles, Coffman enjoyed seeing all of the architecture and feasting on the local cuisine. While going through Paul McCartney’s childhood home, Coffman, himself a photography enthusiast, focused on the camera McCartney’s brother used to take pictures. “I’m glad I did go,” said Coffman, of the Village of Springdale. At the Cavern Club, the original building had been demolished back in the 1970s, with a facsimile later built in its place. “It was hot and sweaty,” Davis said. “They re-created the smell and the sticky floor,” added Bill Headen, of the Village of Alden Bungalows. In another bucket-list-worthy moment, Fraser met Len Garry and Colin Hanton, who were the bassist and drummer in Lennon’s first band, the Quarrymen. The location: St. Peter’s Church in Liverpool, where Lennon and McCartney first met in 1957. Fraser, Garry and Hanton even played “Twenty Flight Rock,” the same tune McCartney played for Lennon that first day. The group visited the building that used to be Decca Studios, where the Beatles recorded 15 songs as part of an audition in 1962. The record company rejected the band. “That was the worst business decision of all time,” Davis said. And it wouldn’t have been a Beatles trip to London without some of the members getting their pictures crossing Abbey Road to re-create the famous album cover. Now back home, those members have several hundred photos to help bring back the memories of their journey.